There is growing concern about unhealthy eating habits in children and youth including not eating enough vegetables and fruit and consuming too many processed foods and beverages. Involving children in food literacy programs, particularly those involving participatory cooking and learning, helps children learn where food comes from, how to choose and prepare healthy food—and can result in healthy eating behaviours such as choosing more vegetables and fruit. In this webinar, join three speakers with a wealth of experience in developing and providing food literacy programming for children who will share about their innovative community food literacy programs in Ontario. 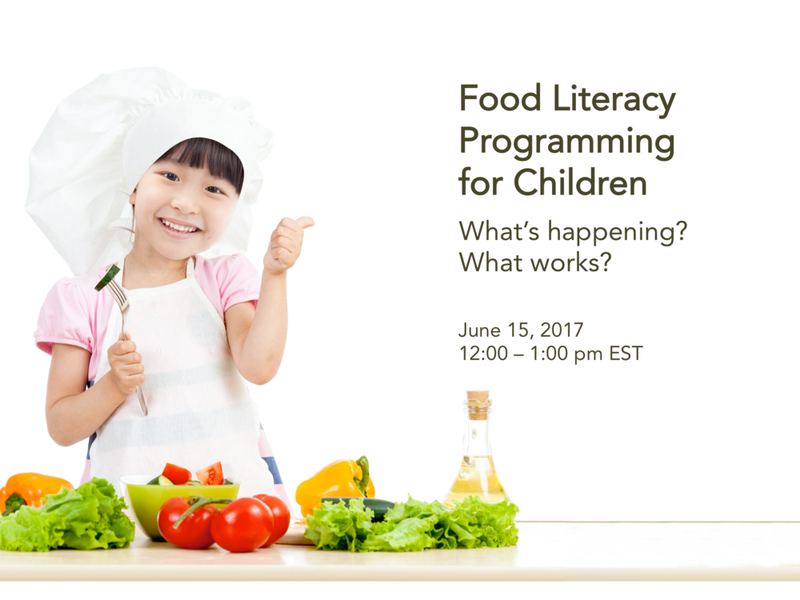 Sandra Maxwell and Lucy Valleau will discuss You're the Chef, an evidence-based and evaluated food literacy program for children focused on increasing vegetables and fruit intake. You will also hear about Adam Hudson's hands-on cooking workshops offered to school children in Northumberland County at the Port Hope Community Health Centre. You will learn how these programs were initiated and developed; lessons learned; how to engage educators, parents, and peers; and gain ideas for how to promote food literacy programs in your community. Learn more on the Nutrition Resource Centre website.